Would it be cocky to say this recipe is just so simple? I don't think so. I really do think all of you can make this, and it's a great way to use some leftover chicken that you have! It's definitely inspired by Bon Appetit's version, which was a shredded chicken noodle salad with a slight change in ingredients including udon noodles over chow mein. 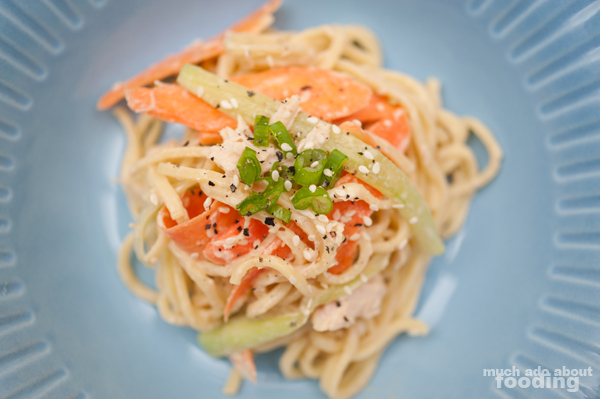 I like the extra flavor that chow mein noodles give though, and overall, the tahini gives a fun creamy taste to this dish without you thinking/knowing that butter or actual fatty cream is making that texture. It's also a nice way to either start a meal or just have as a meal! If you don't have leftover chicken breast you can tear already or if you aren't using the canned chicken breast from Costco, grill and/or boil a chicken breast. For any of the origins of the chicken, let cool before shredding into pieces with some garlic salt added to taste. Prepare the chow mein noodles as explained on their packaging. Slice carrots, julienne cucumber, and chop scallions. In a large bowl, combine tahini, rice vinegar, soy sauce, and red pepper. Then add carrots, cucumber, and scallions. Then add chicken and noodles; mix well. Refrigerate for approximately 1 hour. 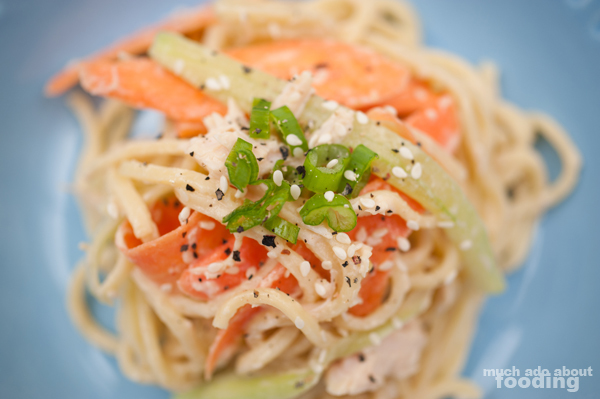 Then, serve and enjoy with some sesame seeds to top!